One of the toughest aspects of producing great stories (besides all the sleepless, anxiety-riddled months spent crafting the darn things) is finding a good first reader. I don’t mean Mom — who will defend your work as brilliant like a pit bull defends its raw-hides. And I don’t mean your best friend — who swears a monthly oath, he’ll get to it as soon as things calm down at work or at home. A good first reader is one who will promptly read and critically evaluate the entire manuscript. One who will identify the trouble-spots: quicksand exposition zones, Gordian plot-knots, and crumbling character arcs. One who will throw spotlights on the hidden gems and help you tease out the scintillating truths, themes, and genuine, rock-solid story you’ve been trying to tell. And telling that story in its most rock-solid, polished-gem form is how you delight fans. 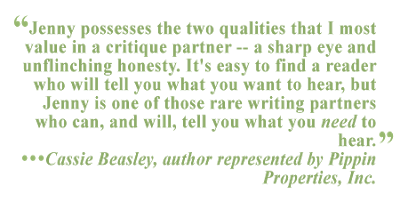 It is also a key factor in landing an agent or securing a publisher for your work. I am available to be that first reader for my fellow writers. Heck, I’m available to be your second and third reader, too. I am trained and proficient in fiction, nonfiction, and genres (fantasy, noir, Gothic, romance, etc.). I am comfortable with work intended for readers of any age, though my specialty is in writing for children and young adults. I’ve honed these skills training with and learning from amazing, award-winning authors like Mark Karlins, Julie Larios, Bonnie Christensen, Coe Booth, Tom Birdseye, Martine Leavitt, M. T. Anderson, and Rita Williams-Garcia, to name only a few. I’ll provide a substantial and detailed written critique (10-15 pages) assessing the strengths and weaknesses of your manuscript on elements like plot, theme, character, point of view, setting, structure, and more. I’ll evaluate what works, what doesn’t work, and I’ll make suggestions for how to make it all work (which may include writing exercises, recommended reading, or other inventive approaches to help you render the most out of your storytelling on the page). If you are in need of a manuscript critique, contact me: jen.michelle.mason (at) gmail (dot) com. I’d be delighted to help you polish your novel or novella. 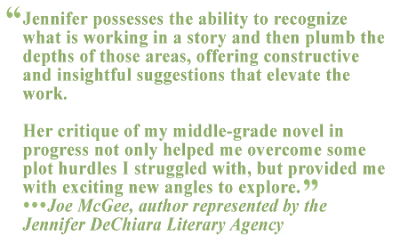 Whether you need help with a snagged short story, or the opening chapter of a not-sure-where-this-is-going-novel, contact me to discuss an appropriate rate for your assessment needs. NOTE: I am currently running a 10% discount for unpublished authors! Really glad to hear this. Loved having you as a professor in my “Scene and Setting” class at Southern New Hampshire University. I can’t imagine having a better person critiquing my story. So good to know I was at all helpful to another writer!